METAL ALLEGIANCE will return to Anaheim, California on Thursday, January 25th at the House of Blues for their annual metal assault! Today, the band is proud to announce TASCAM/TEAC will sponsor the unforgettable night which will introduce Bobby Blitz (OVERKILL) and John Bush (ARMORED SAINT/ex-ANTHRAX) to the all star line-up that METAL ALLEGIANCE is known for. Watch the trailer for the show below! The night will also feature the core four - David Ellefson, Alex Skolnick, Mark Menghi, and Mike Portnoy - who are taking a short break from recording their second full-length album. Joining them on stage is Mark Osegueda (DEATH ANGEL), Gary Holt (SLAYER/EXODUS), Chuck Billy (TESTAMENT) and Andreas Kisser (SEPULTURA). The night will also be sponsored by Musicians Institute and Murder in the Front Row Book and forthcoming documentary and will include direct support from Nuclear Blast Entertainment label mates WEDNESDAY 13. Opening the night are SUPERFIX, EDGE OF PARADISE, and a special Musician’s Institute formed band. General admission tickets for the night can be purchased HERE. "We've been doing METAL ALLEGIANCE shows in Anaheim at the end of January almost every year and it is always THE metal event of the year" comments Mike Portnoy. "Each year the show gets bigger and better and I look forward to another metal extravaganza in January!" 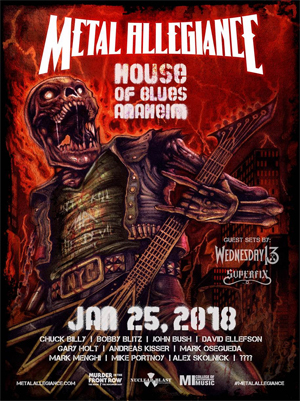 "The January gathering of METAL ALLEGIANCE friends in Anaheim has become an annual tradition, with each concert promising a special lineup and set list that's different from before," comments Alex Skolnick. "This time around, we have an abundance of fresh original material to add to the mix, as well as familiar classics, and it's always a fun time. Join us if you can!" David Ellefson states, "It's time for our annual Metal summit in Anaheim" With new songs and album in the works we're looking forward to bringing the tribe back together to celebrate all things Metal in January!" Once again I am honored, and excited to once again be a part of it!" comments Mark Osegueda. "We are really excited and looking forward to being a part of this year's METAL ALLEGIANCE show in January 2018" comments Wednesday 13. "This will be such a different audience for us, and we are excited to be included alongside such legendary musicians. It's gonna be a great show." METAL ALLEGIANCE will have a signing at the TASCAM/TEAC booth at NAMM 2018. Stay tuned for more info!